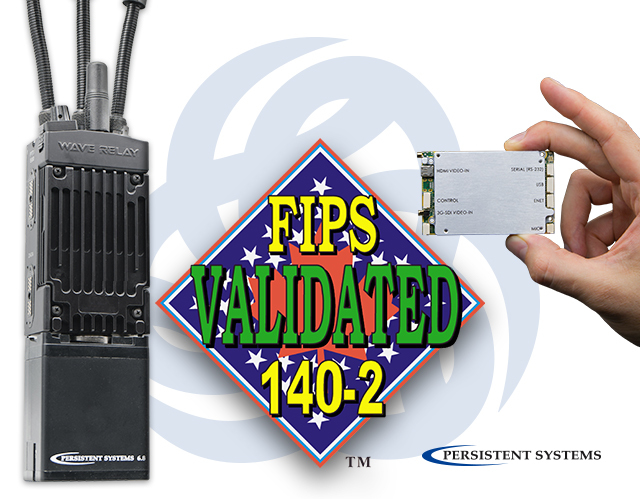 NEW YORK, N.Y. – Persistent Systems, LLC (“Persistent”) announced today that it has received a Federal Information Processing Standards (FIPS) 140-2 security validation from the National Institute of Standards and Technology for its MPU5 networking radio and Embedded Module products. Government agencies that require this information security validation will now be able to make wider use of Persistent products. The MPU5 runs the Wave Relay® mobile ad-hoc networking (MANET) routing protocol, allowing users to transmit and relay voice, video, text, and sensor data in a true peer-to-peer fashion. The Embedded Module delivers similar capabilities in a smaller model made for integrating into unmanned systems and sensors. Customers in the U.S. Department of Justice, the Department of Homeland Security, and elsewhere already use the MPU5 in daily operations. However, to connect to federal enterprise networks, many agencies require a FIPS 140-2 validation, a standard for hardware and software cryptography that ensures devices can protect the security and integrity of sensitive data. To get validated for FIPS 140-2, the MPU5 and Embedded Module were put through the Cryptographic Module Validation Program (CMVP), which are the security requirements for cryptographic modules. The CMVP is a joint initiative between the National Institute of Standards and Technology in the United States and the Communications Security Establishment (CSE) in Canada. Persistent has been putting its MANET radios through FIPS 140-2 validation since 2010, and the MPU5 and Embedded Module’s validation continues Persistent’s commitment to security. Government customers should ensure that wireless networking products are on this list prior to purchase. The latest MPU5 firmware can be obtained by Persistent customers from the product support portal.